By working to maintain clean and beautiful parks we are promoting sustainable communities and providing valuable outdoor spaces for native plants and animals and supporting the well-being of those living within the community. The Penny H. Howe Barrier Free Trail is located in the North Mountain District of the Phoenix Mountain Preserve. The park trail loops through the North Mountain Park Picnic Area and is an easy, family friendly, paved handicapped accessible hike. Named in honor of a dedicated volunteer, who committed much time and effort to the preservation of open space within the City of Phoenix, the trail was established in November, 1993 and contains ramadas, grills, playgrounds and baby stroller and wheelchair accessible paved walkways, is close to restrooms and offers areas for local flora exhibits with interpretive signage on flora and fauna. During the economic downturn of 2008, this trail’s local flora exhibits experienced the failure of the irrigation system and the system was not able to be replaced due to financial constraints. Subsequently the flora died off and nonnative, invasive flora moved in. The signage has fallen to disrepair and the pathway, while in very good condition, is in need of increased structural support to maintain the current condition. While the park is in usable condition, it is diminished and does not provide what was intended or is possible. The hike currently ranks 2 stars of 5 on the “Alltrails” site. There is currently no funding available to shore up the trailway or restore the flora and signage. What is likely is it will remain this way without intervention and over time, diminish further. Shore up the walkways using current technologies in drainage friendly, naturally sustainable materials. 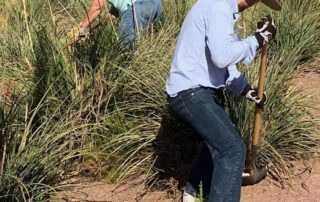 Celebrate the restoration of the Trail with activities and a reopening The project is likely to take several years for completion, with work taking place primarily through the cooler seasons of November through March and ending March 2020. 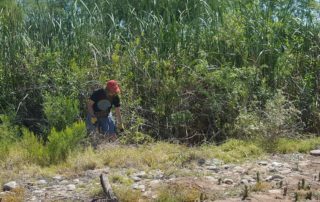 Restoration of two riparian areas. Critical piece of the greenway. The goal is the rid the park of trash, invasive plant species, and overgrown brush, and build new walking/bike paths throughout the area. This is a critical bird habitat. 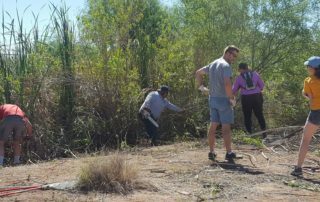 AZSA volunteers are assisting the City of Tempe in restoring this park to its full potential through invasive species removal, trash pick up, cutting out overgrown vegetation, and filling in holes left behind from the old, nonfunctional irrigation system. Eventually we will also be working to establish a permanent walking path by the two riparian areas to encourage visitors to admire and enjoy the beauty of this park. 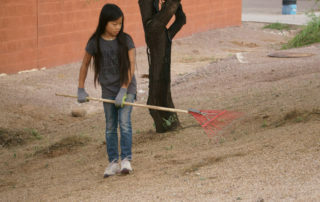 AZSA works to complete park cleanups and conservation/trail maintenance work throughout the North Mountain Park. This is the most trafficked park in the Phoenix Metropolitan area. At 2,104 feet, North Mountain, and 2,149 feet, Shaw Butte, are easily recognizable landmarks in the north valley skyline. 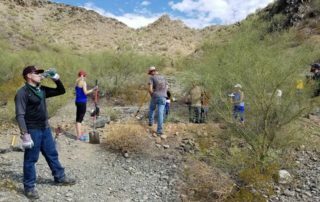 The mountains offer a wide array of trail options for hikers of all abilities and bolsters two of the best summit climbs in Phoenix. 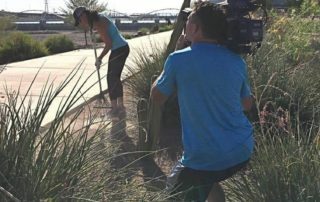 AZSA is currently assisting the City of Phoenix in a large-scale project to clean up the park along 7th Street by the the North Mountain Visitor Center to remove invasive species, clean up trash, remove low hanging branches and overgrown vegetation, and beautify the park entrance to attract more visitors. 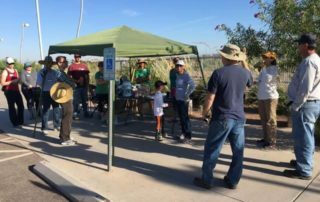 by James Brucker, Adopt A Park Leader The Septempber 19th Tempe Park Clean Up was very successful. Nine people participated. We trimmed the flower and seed stalks all the Red Yucca plants in the park.